Fifteen years ago, 317 Springtown Road was an abandoned 27 acres farm, and an eyesore to everyone. What Ray saw was an opportunity to actualize his dreams of having a place to raise animals and grow vegetables, fruits, herbs and flowers to share with others. Full of potential, his field of dreams has become a working farm, home to chickens, bees, pigs, and the occasional stray cat, along with row after row of vegetables, flowers and herbs. Ray may have a way with farming, but he got his start in the restaurant industry. He began humbly enough, “peeling carrots” in 1976 for a hotel chef who split the years mainly between Cape Cod and Clearwater, Florida. By the decade’s end he learned enough to move on – and up – running the Ram’s Head Inn restaurant in Shelter Island for three years before migrating to Manhattan. Initially, he felt (in his own words) “way over my head” working as sous chef for the storied Le Cirque. But his subsequent stints – including The Westbury Hotel’s Polo and Montrachet – suggest anything but defeat. It was during this time that Ray rubbed elbows and prepared dishes with a rising group of soon-to-be culinary stars like Daniel Boulud and Thomas Keller. Of these, childhood friend and fellow Connecticut native David Bouley proved his most memorable collaboration. The two reconnected in the mid-80s at Montrachet, before moving on to start Bouley. It was here that Ray helped build the heralded restaurant from the ground up, literally, serving as sous-chef and carpenter both, prepping meals, purchasing product and running the meat station, while laying down mason and installing fixtures with David and his brother. In spite – or perhaps because – of Bouley’s success, Ray found restaurant work to be taxing (“it never ends, unlike farming”), so he moved on after three years. 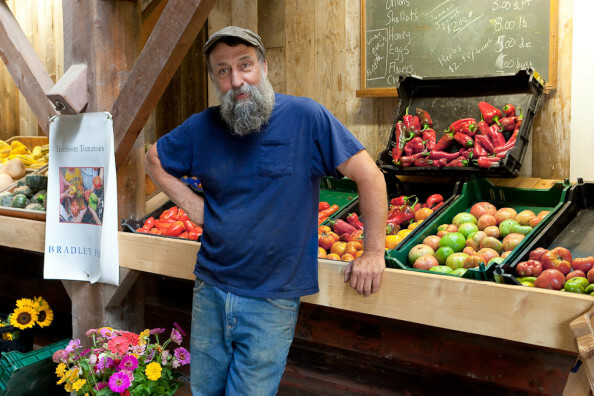 In 1990 he left to work as a distributor with Frank Wilkow while renting a small plot of Wilkow’s land in New Paltz to grow his own organic vegetables. He started selling this produce directly to the people, at the then-new Grand Army Plaza Greenmarket. Three years passed and Ray again switched gears, moving to Costa Rica to oversee the kitchen at a friend’s bed and breakfast. Contemplating a more permanent shift south of the border he, and I quote, “chickened out,” returning to New Paltz and renting land across the street from a million dollar horse farm to expand his organic lot. After gentle prodding (“stop working for other people!”), he contemplated starting a farm of his own. In 2000, Ray began farming 27 acres of land on Springtown Road and opened Bradley Farm. And he hasn’t looked back since.